Flue Adaptors don't Work, here's why. Some retailers will offer products designed to increase a single skin pipe to adapt it to work with larger diameter flues. Larger diameter flue systems reduce the performance and efficiency of a stove, which defeats the purpose of buying one in the first place, but these adapters don’t work anyway. It is foolish to assume that clay liners are correctly installed. We are regularly called to inspect flue systems where liners have been installed upside down or with mis-aligned joints. These faults can lead to leakage that was perhaps not evident with an open fire. High flue gas temperatures from open fires tend not to cause condensing issues. These condensates could be further compounded when clay liners are not back filled with insulation during construction, which is often the case. Worryingly these adapters actually contravene building regulations, so once again the misinformed retailers are palming customers off with products not suitable for use. 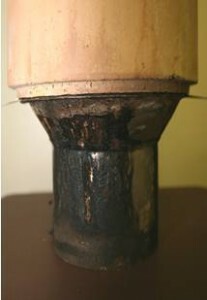 It is a requirement that all spigot and socket connections within a flue are orientated to ensure they contain moistures. This is the case with vitreous enamel pipe, flue liners and twin wall flue. The design of these adapters allow for the sleeve to be offered inside the existing flue, effectively an upside down joint, which encourages condensate to weep at this union point. Imagine your frustration when you are encouraged to buy an adapter from one of these rogue retailers in an effort to prevent condensate, to find that the very product they sold you doesn’t work and is against building regulations. Surely solving the problem of condensate accumulating is a better solution than trying to contain it. Condensate leads to tar build up in chimney, which leads to major chimney fires and structural damage. Your property…your choice.